Krispy Kreme flops again. 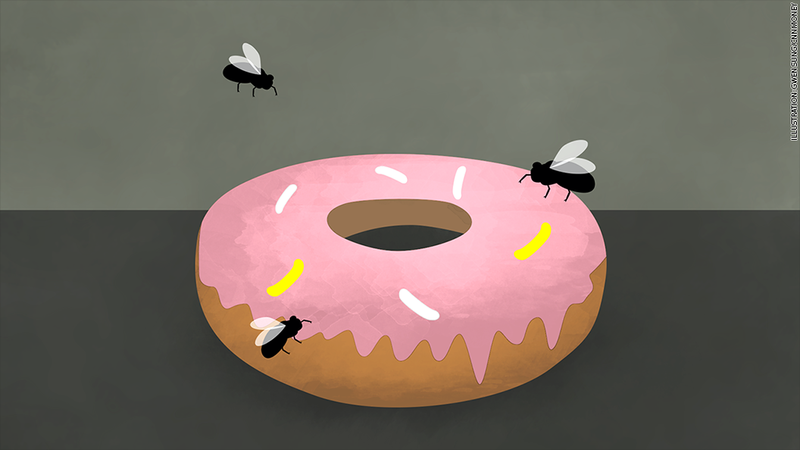 Is the doughnut fad over? Have Americans fallen out of love with doughnuts? Probably not. But they don't appear to be nearly as popular as they once were on Main Street ... and Wall Street. Krispy Kreme (KKD) reported quarterly sales and profits after the closing bell Tuesday that missed Wall Street's forecasts. The stock fell 8% Wednesday morning and is now in the red for the year. It's the second straight earnings disappointment for Krispy Kreme. While sales were higher during its most recent quarter, the company noted that it was helped by "limited-time offers and other promotional and marketing incentives." Krispy Kreme is resorting to gimmicks like offering a dozen free doughnuts to people dressed like buccaneers on "Talk like a Pirate Day" back in September. It currently is touting a Day of the Dozens promotion tied to the fact that this Friday is 12/12. Customers can buy one dozen pieces of fried round dough and get another 12 for free. Sure, it helps get people in the stores, but it also shows just how competitive the business is right now. Too many choices? Dunkin' Brands (DNKN)reported sluggish sales when it released it latest results back in October. Its stock is also in the red for 2014. The breakfast wars are real. Starbucks (SBUX) and Tim Hortons (THI) -- which is in the process of being bought by Burger King (BKW) -- also offer pastries and java. McDonald's (MCD) and Taco Bell owner Yum! Brands (YUM) are trying to attract more early risers. There's also a lot of competition from smaller local chains. The Doughnut Plant is big in New York City. 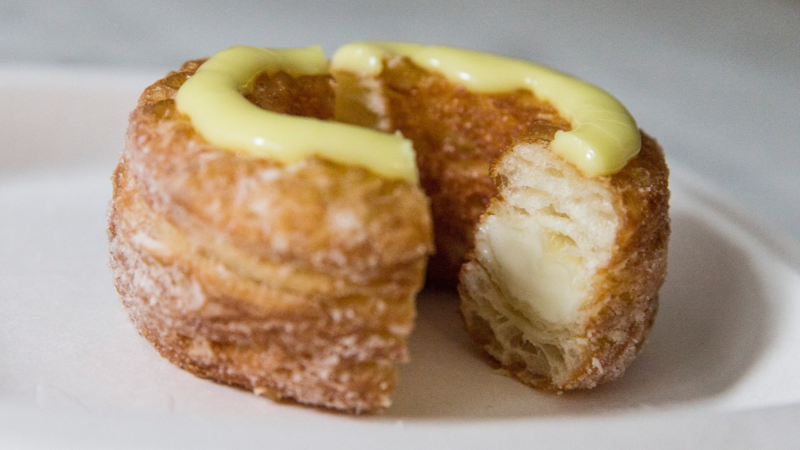 Another New York baker also started a culinary craze with the cronut, a hybrid croissant-doughnut. Dunkin' Donuts now has its own croissant donut as a result. Still, there is some hope for a Krispy Kreme turnaround. New CEO Anthony Thompson, who joined the company from Papa John's (PZZA) earlier this year, said during the company's conference call with analysts that he thinks the company isn't as big of a victim of the breakfast wars as you might think. 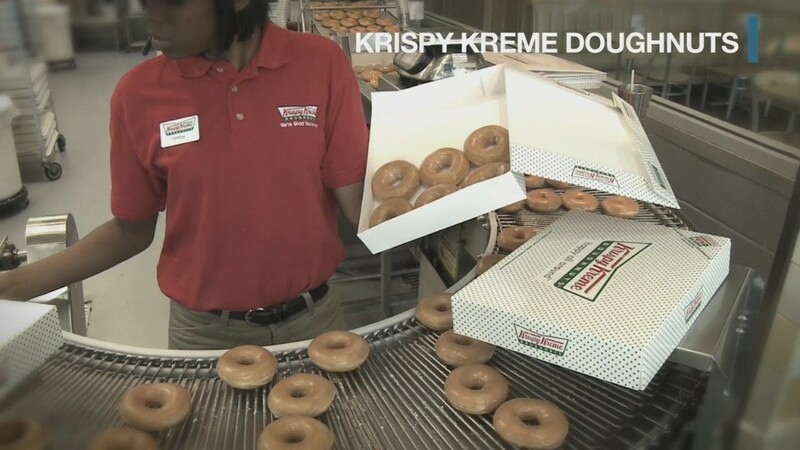 "We do as much or more business in our Krispy Kreme shops after 2 PM as we do before 2 PM," he said. But it seems that the big challenge for Krispy Kreme will be to get consumers to go a little more upscale in order to boost sales and profits. Thompson used some awful corporate jargon to make this point, talking about how the company can "leveraging our iconic craveable brand" to "increase the beverage attachment rate for consumers visiting our shops." Translation: Krispy Kreme needs to sell more overpriced, specialty coffee drinks like Starbucks and Dunkin'. Might I suggest an Apple Fritter Latte? Investors see many holes in the stock. But traders on StockTwits are still mostly skeptical. One correctly predicted how much the stock would drop just after the earnings report came out. "$KKD Same store sales decreasing as well as store operating income. Could see below 20 tomorrow," wrote JrseyFightsJosh. You nailed it. The stock is currently trading just above $19. Investors seem to be tired of watching Krispy Kreme fail to live up to the market's expectations. "$KKD - man, this one got creamed again? Every ER same story," said pointbreaker.